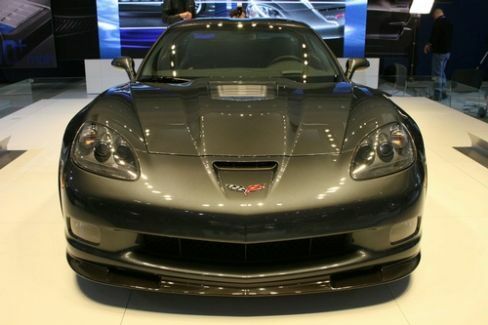 Cars - email Corvette ZR1 - The American SuperCar to a friend! America has a SuperCar, or at least this is what Chevrolet general manager Ed Peper is saying (thinking) after showing to the public the new Corvette ZR1 at the Detroit Auto Show. Corvette is deep inside he blood of every American that needs speed and looks, but the we ZR1 is really business. It comes with a supercharged 6.2-liter V8 engine that sports 620 hp and a 823 NM (595 lb/ft) torque, being able to hit the 200mph speed, while the speedometer has a 220 mph on it. Corvette’s ZR1 basic stats include a manual six-speed gearbox (race hardened), a high capacity dual-disc clutch or larger brake calipers. The design is great, with a raised carbon-fiber hood and carbon fiber panels prominent inside on the fenders, the roof and front splitter. Consider 19-inch or 20-inch chrome wheels and a dark color for the American SuperCar and it’s looking furious.